TinyBuild has also laid out exactly what fans get for pre-ordering the game. TinyBuild’s upcoming horror-adventure game Hello Neighbor isn’t set to fully launch until December 8th, but the studio has now shared a brand new trailer to celebrate the Halloween season and show how the game will look in its final build. According to a press release which was sent out by TinyBuild CEO and Hello Neighbor producer Alex Nichiporchik, all of the footage shown in the below Halloween trailer was taken from the game’s final release build, i.e. the build that players will get to experience after the December 8th launch. During these last few weeks before launch, Nichiporchik says the Hello Neighbor development team is focusing on quality assurance, ensuring that the game is as stable and bug-free as possible when it does finally launch in December. In a separate Steam Community post, Nichiporchik also outlined the various pre-release builds of Hello Neighbor which are now available, as well as which builds can be accessed by pre-ordering the game’s PC version. 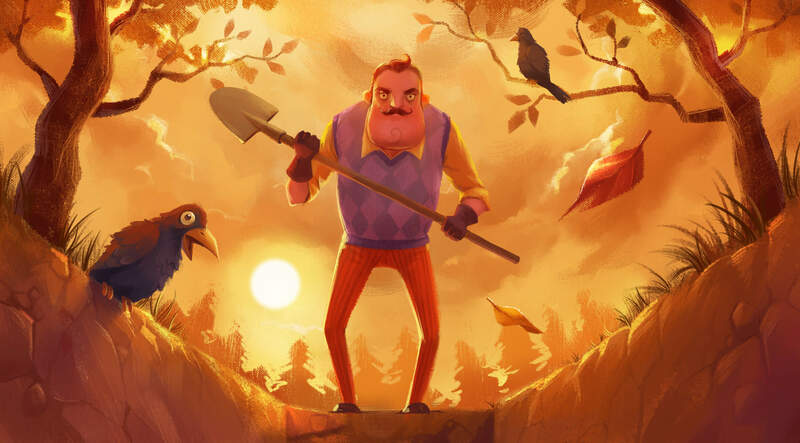 In total, there are eight different pre-release versions of Hello Neighbor, three of which can be downloaded and played for free by visiting the Hello Neighbor website. The other five are available as pre-order bonuses. Pre-Alpha - early proof of concept build with a simple house with 1 floor. Alpha 1 - a prototype build with a large house, two floors, and in-between art style. This is the one with the shark puzzle. Alpha 2 - a tutorial style build with a story intro, and final artstyle. This one represents how Hello Neighbor will play. It has a creepy 2 story house, but less content than Alpha 1. The AI works really well here. Alpha 3 - has a draft of the final house in a darker setting. AI isn't final, but the house's layout is already large and complex. Alpha 4 - more expanded house, proper day time cycles, updated AI, first glimpse at fear story sequences. Beta 1 - don't play this if you don't like bugs. This is where we upgraded the engine and while the house was also updated, the AI and stability of the game aren't great. Has a proper intro. Beta 2 - less glitchy, still rather unplayable. Good for people who want to get an idea of how we iterated. Beta 3 - recommended current build. Has loads of content, and the AI can finally properly navigate multiple floors in the large house. In addition to PC, Hello Neighbor will also be released for Xbox One.